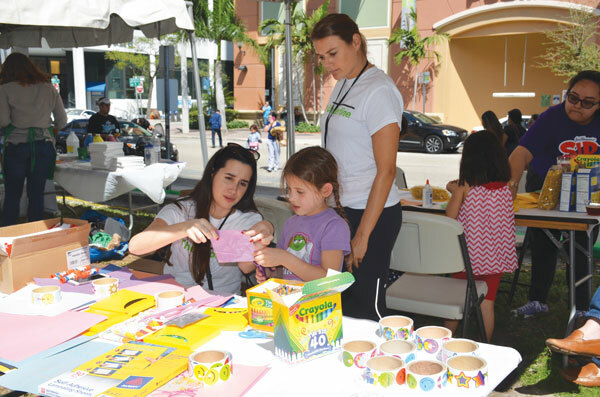 UNDERLOUNGE powered by Baptist Health South Florida brought the Brickell neighborhood to life with over 1,000 guests enjoying a free festival celebrating biking and community at the Brickell Metrorail station from Noon-4 PM on Saturday March 11th. 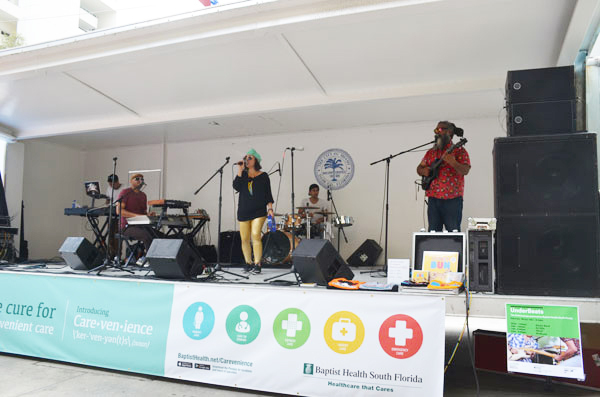 The outdoor event featured live music performances by local musicians including Grammy-nominated Palo!, Elastic Bond and RioALuna, interactive art classes by Bottle and Bottega and local artists showed off their creative talent with a bike painting display. The temporary outdoor gym was alive with free yoga, Zumba and boot camp sessions. 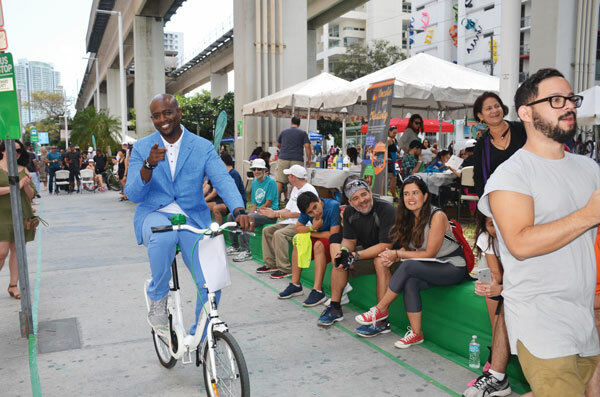 And, at 1 PM volunteer models biked down the UnderStyle fashion runway wearing the latest fitness and lifestyle looks provided by Brickell City Centre boutiques including Lululemon and Harmont & Blaine. Guests enjoyed yummy food from local restaurants Perricones Marketplace & Café, Italian Pizzetta, Drunken Dragon, Vice City Bean and Paleta305. And, craft beer was on tap from the Tank Brewing Company. 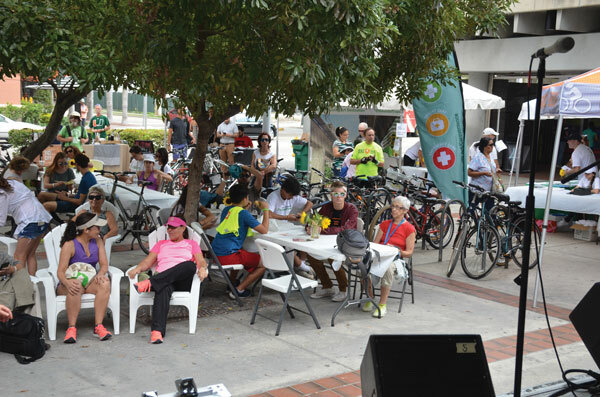 Over 100 people arrived on bike as they rode from Dadeland North Metrorail station for Bike The Underline with Bike 305. Start your weekends off right with good vibes and great health as Friends of The Underline kicks off UnderFit powered by Baptist Health South Florida with FREE yoga classes two times a month at 9 AM at Brickell Metrorail station. And, on Saturday April 22nd, get up and clean up with Friends of The Underline as we celebrate Earth Day with a volunteer clean up of the future Underline from the Miami River to Coral Way. Sign up for UnderFit and Underline’s Earth Day on Eventbrite. We are astonished and honored (and really excited!) to be named one of Fast Company 2017’s World Changing Ideas for health. See the full list here http://bit.ly/2mkJOxz. For more info about The Underline visit TheUnderline.org, or @theunderlinemia on Facebook, Twitter and Instagram. South Miami Hospital’s Reggie Laroche on fashion bikeway. (L-R): Kieran Bowers, Meg Daly, Jorge Plasencia, Clare Laverty, Myk Likhov, Saskia Bowers and the Bowers’ family children.